Explore WA are passionate about the bush and we are equally as passionate about getting people out amongst nature & promoting the values and attitudes that ensure we are all able to do so into the future. Through our pre planned trips we aim to showcase the regions in which we travel with the local knowledge, history and cultural insights to ensure you have a truly memorable journey with us. Above all – We want to get people out of town and into the bush! We make sure its done in a fun, small group environment where everyone gets to feel like they’re travelling with a group of friends! Bring along your 4×4 vehicle on our trips, where you join in on the trip route we have carefully planned to provide maximum fun & enjoyment. See the places you need to see, the hidden spots & travel with a group of like minded people. Each trip is different at Explore WA, with trips from weekend adventures to multiple week journeys through some of the most remote countryside in Australia. Check the relevant info sheet for the adventure you are interested & it will outline inclusions. On all our adventures we take care of access permits, camp fee’s, National Park entrys & the support & service of an experienced trip leader with local track & area knowledge. There is a lot more to each adventure that can be written here & on some trips things like camp stews, nightly nibbles & helicopter rides may be included. Visit our info sheet’s here. To see our standard inclusions, click here. Our trips all vary with what you might pack. We have a handy memory jogger checklist that can be sent & adapted to the adventure you’re interested in. We will always chat with you in the lead up & booking process to answer any questions. Small groups & we mean it! – Its what we’re known for. Too many vehicles make off road adventures a chore & its really what sets us apart from the competion. You can expect between 5-8 vehicles on a Tag-a-long depending on the trip. Do we need to be experienced? We have been across the traps for a while now, & offer up our advice & knowledge of offroading throughout Australia to anyone who needs it on tour. 4wd’ers are a helpful bunch & on the trips we always love helping teach you some new skills if your faced with a situation you haven’t seen before. Modern vehicles now have a raft of buttons and features and we can run you through them to get the most out of your 4wd out bush! Do you hire camping equipment? Yes, we have various camping equipment for hire such as swags, tents, & fridges to name a few. Do you do club or group trips or custom trips for friends? Of course, they are some of our favourite trips away & we always have a list of options to suit what your group would like to do. About Jed the founder of EXPLORE WA. 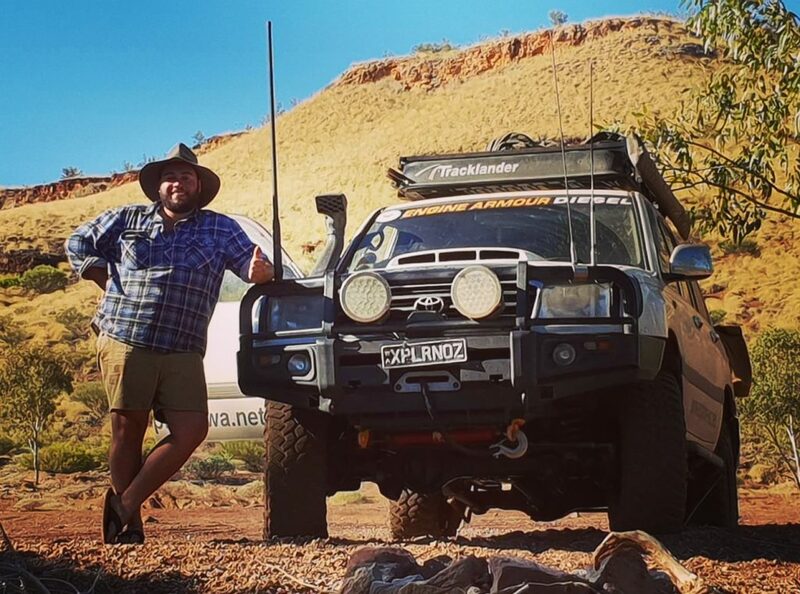 My name is Jed and I founded Explore WA in 2014 as a way in which to get others out in the bush, through pre planned adventures that showcase regions throughout WA. The reasons behind the idea to create what is now Explore WA 4wd Adventures are extensive. Put simply, there was no platform that got people out in the bush that was personal, size restricted and packed full of detailed knowledge to areas other than the major tourist routes. I saw the opportunity to showcase select regions in WA backed with the support, equipment & knowledge to ensure my guests were in safe & experienced hands while on tour. We are privileged in this Country to have access to some of the most pristine environments on the planet, rich in both life and history. From the gorges in our north to turquoise waters in our south we are simply spoilt for choice here in WA especially. I truly believe everyone should have access to see what few ever get to experience. Whether helping those with no exposure to off-roading gain skills and confidence through our training or leading trips to remote destinations throughout WA the passion remains unchanged. Simply being amongst the bush and promoting sustainable access to the areas in which we travel is what its all about for me. Sharing the history of these places too also has to be equally important – its too valuable to lose to the future. Looking after our own backyard ensures we will have the freedom to enjoy it into the future. Enjoying a few beers by a crackline fire under the million star hotel really makes it that more special!